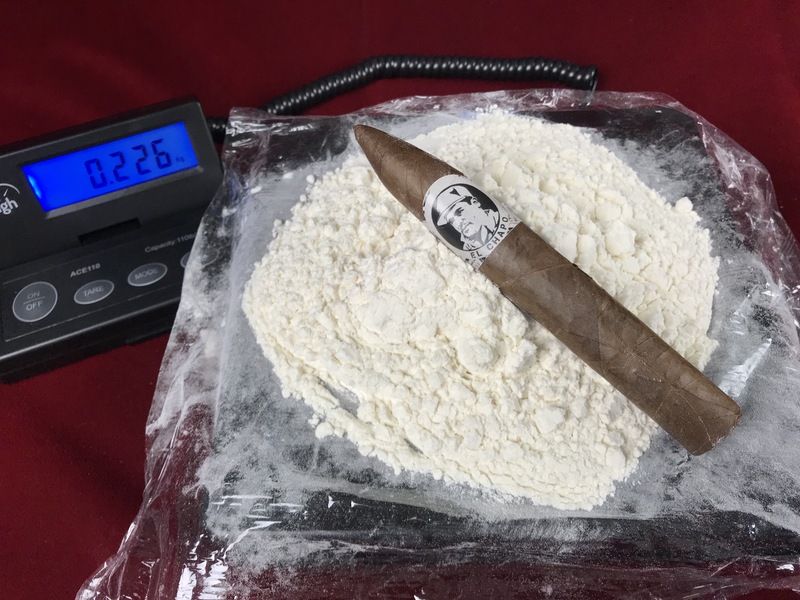 The original El Chapo blend is back form Traficante Cigar Company. This Belicoso is a well-blended combination of aged tobaccos including a maduro wrapper leaf and a blend of Dominican and Honduran long-fillers. The cigar has a nice thin smooth maduro wrapper with some veining. It has a nice oily sheen to it and is a dark tan leather color. The construction seems well and the cigar feels full yet gives to bit of pressure between the fingers without damaging the wrapper. Pre-light draw is easy and clear. The smell from the body is very floral with clear notes of nutmeg and spice, from the foot the same notes are present but with an added sweet chocolate smell as well. The cold draw gives flavors of the nutmeg noticed from the smell, light roasted coffee beans and a punch of rich tobacco. The cap cuts with no problems and lights easily. Immediate flavors are loads of tobacco, saltiness and dark chocolate. The cigar flavor stays fairly consistent until reaching the midpoint. The burn stays even with no need to retouch at anytime, the ash hangs on tightly until knocked off and is dark grey in color. It produces plenty of dense smoke which has a medium weight on the tongue. At the middle of the cigar the flavor mellows a bit and the bitter dark chocolate subsides and pepper and spices pull to the front. This flavor continues for the remainder of the cigar and is very enjoyable. The El Chapo is definitely not for the faint of heart; it is a full-bodied powerhouse of a smoke that will give you plenty of flavor and smoke. Make sure you put some time aside to smoke this you’ll want to enjoy the flavors and not rush through it. Looking forward to burning one of these!